Actually, I accidentally found this Strandvagen named area. If not for my friend who decided to walk to Gamla Stan after our visit Djurgarden, I certainly would never know Strandvagen. I cursed back tourist brochures do not mention that this lovely place and feeling grateful that my friend had the initiative to pass Strandvagen. When I drove past the bridge to the island Normal, I immediately see the sights Strandvagen. A blend of modern architecture building is equipped with a dock in front of him. Strandvagen is the most prestigious areas in Stockholm. Apartment prices here are very expensive, comparable to the luxury offered this place. Strandvagen construction began in 1800. The first concept is proposed to Strandvagen dock pedestrian area planted with trees. While the construction of piers and pedestrian area in progress, construction work for buildings along Strandvagen also started. Bunsow House which was built in 1886 not only became the standard for all buildings in Strandvagen, but also for the entire architecture of Sweden in 1890. Strandvagen characteristic is the use of the building in the tower and brick, and the brick is formed various patterns on the walls of buildings. Strandvagen picture in 1800, when the construction took place, showed on the edge pedestrian area. From the pictures it is clearly seen that to date Strandvagen not undergo significant changes. Strandvagen streets stretched long and scorching sun is not at all suited to accompany me enjoy this place. fortunately Strandvagen pedestrian area filled with trees so it feels more calm weather. Right and left is a pedestrian area highways where various modes of transportation through Stockholm. Even so, it looks quite deserted road and public transport was seen only a few times past this place. Tourism in Stockholm city means walking in a straight line between the trees that shade the road. 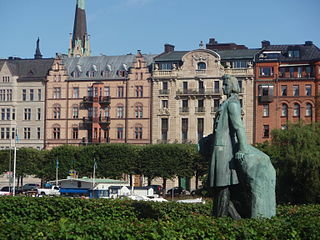 All building does look more modern, but still reflects the architecture of the 18th century Sweden. Brick building was equipped with a tower, window, simple carvings on the walls, a balcony, and a dome on the roof. If you’ve had a architecture old city of Stockholm on Gamla Stan, you need to stop by the Strandvagen to see another side of modern architecture Stockholm.